In the first week of July, I went to Israel to write about a TV show. On June 12, one month before I landed, three teenagers — 16-year-olds Naftali Fraenkel and Gilad Shaer, and 19-year-old Eyal Yifrah — were abducted while hitchhiking from their West Bank yeshivas, near the settlement of Gush Etzion. By the end of the month, their bodies were found riddled with bullets and partially buried under rocks in a field near Hebron. In direct retaliation, three Jewish settlers snatched a 16-year-old Palestinian named Mohammed Abu Khdeir off the streets in East Jerusalem and burned him alive. And the familiar cycle kickstarted again. The militant Islamist group Hamas began to launch rockets from Gaza. And the Israel Defense Forces responded with coordinated air strikes. My parents grew up in Israel but left for good two decades ago. My grandparents are still there, as is everyone outside of my immediate family. And in the last few years, with my grandfather feeling increasingly weak, my mom has spent more time in her place of birth, Rehovot. About 30 minutes south of Tel Aviv, it’s a quiet but representative town, populated by high-tech companies and nationally renowned scientists, Russian and Ethiopian immigrants, and devout Jewish families. In the days before my flight, as the military action ramped up, my mom promised everything was safe as ever. But when she texted me, in her Cormac McCarthy–on-whippets style, it sounded all the more surreal. We couldn’t help but laugh. But about five days after her message, the missiles and alarms chased the production of the TV show I’d come to cover out of Israel altogether. After eight days, IDF soldiers began a ground invasion of Gaza. It was a Thursday night and I was out to dinner with family in the refurbished port of Tel Aviv. As we walked along the waterfront after the meal, we watched with dread as King Air planes, on communication-scrambling runs in Gaza, came back to the nearby Sde Dov airport, flying thunderously loud and ominously close overhead. The death toll was sickening. From Gaza, we saw the photos of rubble and learned about dozens of deaths a day. From the front page of the newspaper on my grandparents’ dining room table, we saw the Israeli casualties: smiling soldiers, teenagers in uniform. My return flight to New York wasn’t scheduled until the end of the month. In the meantime, I spent nights on a thin mattress laid on the floor of a cluttered spare room in Rehovot, falling asleep to the droning burble of my grandfather’s oxygen concentrator. Coincidentally, the TV show I had come to cover, FX’s Tyrant, was billed by the network as a brazen take on the dirty truth and grand scale of Middle Eastern politics. Its creator is Gideon Raff, an Israeli expat whose 2010 series Hatufim was the basis for Showtime’s smash Homeland. Raff also created a USA miniseries called Dig, which premieres this fall — it’s a Da Vinci Code–esque adventure hinging on the ancient secrets of the holy city of Jerusalem. And not only were both American shows shooting in Israel at the same time, they were doing so as coproductions with Israeli production powerhouse Keshet. The international adoption of a nation’s stories and sensibility is not uncommon. A few years earlier, thanks to the beloved original versions of The Killing and The Bridge, Denmark was the international darling: a tiny place making disproportionate waves on small screens everywhere. Now, with original “formats” being pitched all over the world, it seemed like Israel’s turn. Except that at the moment of coronation — actual American shows coming to Israel to shoot, and with Israeli control — it crumbled. The embittered fictional Middle Eastern politics of Tyrant were blown to pieces by the real thing. This was still Israel. As if we could forget. The first alarm came in the afternoon, on my first day. It sounded like the hand-cranked whoooooooah-whooooooah-whooooooah of old radio serials. My uncle Eyal explained that after the alarm we had 90 seconds to find a shelter or a location considered “safe.” But of course, Eyal said, Kippat Barzel was keeping us secure. 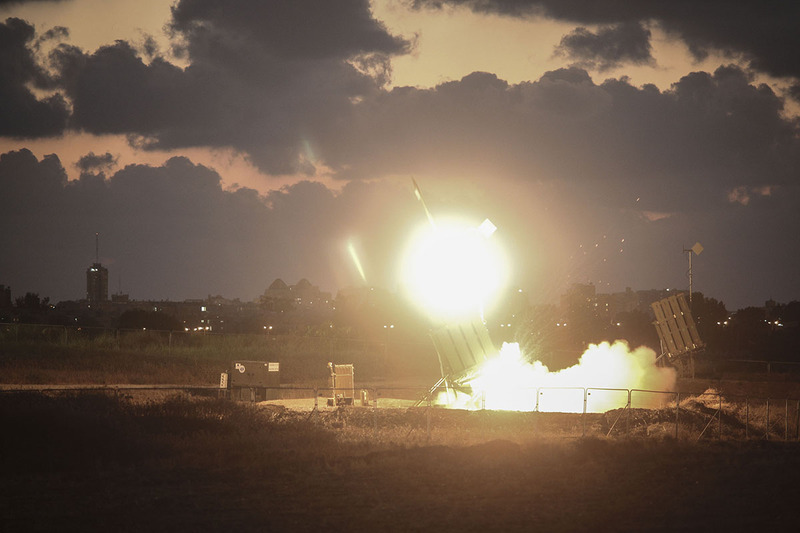 Kippat Barzel is the Iron Dome, the army’s much-hyped anti-missile system. In the U.S., some argued it was all a well-marketed ploy. But in Israel, it’s considered an untouchable godsend. One Saturday morning we made a trip to Palmachim Beach. It was there where my parents, back when they were young kids in love, would drive with their friends to eat watermelon and talk all night. On the way, we spotted the missile launchers of the Iron Dome. Gaza was roughly 40 miles south: If any rockets were to be fired toward Tel Aviv, and were to be intercepted by the Iron Dome, it would happen right over our heads. I treaded water in the ocean and flinched with every far-off noise, craning my neck to the sky, dreading what might happen while in a state of preemptive awe. Nothing did. Later, in town, I purchased an “I [HEART SIGN] IRON DOME” T-shirt. Ilia Yefimovich/Getty Images The Iron Dome air-defense system fires to intercept a rocket over the city of Ashdod on July 16. Before the recent flare-up, the danger throughout most of the country had been minimal. Hamas’s Qassam rockets were DIY creations, fueled by a cocktail of fertilizer and sugar. But these days Hamas was reaching farther than ever into the country, thanks to equipment smuggled in from Iran and Syria and their own technological developments. Still, to extend the range of a rocket, Hamas had to largely strip it of explosive charge. Over 70 Israelis were killed during the conflict, but the vast majority were IDF soldiers, not civilian victims of missiles. But Hamas — which came to power democratically in 2006 before violently exiling its unity government partners Fatah to the West Bank and doing away with elections — is dug in. And so it’s what the group might be capable of in the coming years that’s truly scary to the Israelis. In the meanwhile, Israel’s military superiority continues to lead to a staggering difference in death tolls. The IDF contends that’s in large part because Hamas uses homes as bases of operation, purposefully ramping up civilian casualties to focus more of the international community’s anger at Israel. But either way, the end result was a death toll of under 100 on one side of the conflict and more than 2,000 on the other. I watched my aunt Noma and her kids move calmly inside, toward the house’s designated safe spot — known in more traditional times as “the kitchen.” A few minutes later, an echoing, shattering boom was heard, its reverberations rattling the windows of the house. Huddled together, we shouted “Opa!” and laughed nervously. Then we poked our head outside and saw smoke trails lining the bright blue sky. We could hear the crashing sounds of missiles multiple times a day, catching us in bed in the morning, or out shopping in the streets, or at lunch near the beach in Tel Aviv, where we could watch girls in bikinis evacuating and scrambling to safety. One night, we went to dinner at the home of my dad’s cousin Leor. They grew up together in Gibton, a tiny village near Rehovot, where they’d spent summer days riding a white horse named Nadia to faraway towns and shooting live rounds in the air. Now Leor and his family were serving us a lovely, elaborate multicourse meal. And it was right around the pâté course when the sirens started again. In the dark night sky, we could actually see the far-off missiles: one bright flare chasing another, shooting straight up, then plummeting down again. My mom was right. They looked like fireworks. At home in Rehovot, my grandfather, like so many Israelis, blasted the news on Channel 1 all day. The coverage shifted, jarringly, from whimsy to unbearable heaviness. One minute, a punky pop culture reporter explained that international performers had already begun to cancel concerts in Israel, but that she had tickets to the upcoming Backstreet Boys appearances in Ra’anana, so they’d better show up! When an airstrike killed four children on a beach in Gaza, the network played the footage on a loop, the bodies perversely blurred out. Hoping to calm my growing panic over my crumbling assignment, I visited the Tyrant set. A friend tipped me off to the location. For months she’d been driving by it, in a big lot near her home in the high-end residential community of Kfar Saba, watching the bustle go up. The plan had been to see the grounds in full, a fake Middle Eastern autocracy constructed in the dusty fields of Israel. But by the time I arrived, the palace guard had abdicated: Production had escaped to Turkey, leaving the set empty and lifeless. The grounds were blocked off all around by a low white fence; jutting high above the fence were the handsome burnt sienna walls of the presidential home. The set was lined with shipping containers, unused trailers, and at least one cruiser — marked in Arabic — of the esteemed police force of the show’s fictional country of Abuddin. A lonesome Russian guard patrolled the ghost set. I tried to sweet-talk my way into a tour. “Asur, asur,” he told me patiently — “not allowed” — before returning to his aimless rotations. I’d justified his job description, and it made me smile. There was a war on. Was there one other person in the entire country who’d bother sneaking into this place right now? An incessant alarm rang from the lot next door. Flies circled the nearby ditches and sewage pipes, and a faint smell of manure emanated. A row of wrecked cars sat, left to rust. A cardboard sign promised lunch: shakshuka, schnitzel, sabich. I walked to a space where the guard wouldn’t see me and climbed past thorny bushes and over a low wall. From there, I could see the central courtyard, with its fetching blue screen background, decorated with tasteful lanterns and finely shorn bushes. Squint a bit and it truly was like standing before the majestic capital city of Abbudin. At the supermarket, there was a cart for donations “for the troops.” A man standing ahead of me dropped in a jar of caramel biscuit spread. At the beach one day I tried and mostly failed to properly plant the pole of a massive sun umbrella. A cheery fellow nearby, noticing, put down his matkot and came over to help. “What are you doing?” his buddy shouted from a distance. “Digging a tunnel for Hamas!” he cracked. There were more soldiers in the streets, many with white iPod earbuds snaking out of their uniforms. These were essentially the same soldiers I remembered from my childhood, bored at bus stops and train stations, carrying big guns, eating ice cream bars on sticks. My parents left Israel with my brother, my sister, and me in 1992. We spent two years in the Netherlands, my folks intending — or at least pretending — that we’d eventually return. But our next stop was Massachusetts, which we never did leave. They had their reasons: “job opportunities” and “better schooling” and “the calming sterility of suburban America.” It wasn’t until years later that I’d note the timeline. We left just after the first Gulf War, in which Saddam Hussein retaliated against the U.S. invasion of Iraq by lobbing Scud missiles at America’s friend Israel. In the dark night sky, we could actually see the far-off missiles: one bright flare chasing another, shooting straight up, then plummeting down again. My mom was right. They looked like fireworks. There were sirens then, too, and we’d scurry to our Tel Aviv apartment building’s shelter in the middle of the night. The fear was that Saddam would deploy chemical weapons, and so we carried gas masks in ugly brown cases that we decorated with dinosaur stickers. Eventually we left Tel Aviv to stay with family in Jerusalem. It’s a strange memory, but not a harsh one. In the photos, we’re wearing sweatpants, throwing up thumbs and smiling through the masks. The sight of my little brother zipped up in a giant yellow plastic mask always reminded me of E.T. in the hospital. Both of my grandfathers served in the army. It was 1948, the War of Independence, and they were still teenagers. My mom’s dad would go on to become an academic and an aesthete. Or maybe more of a fanboy: The way he talked about Bach, Bartok, and Brahms had the charm of the geek-out. During a battle in Hulayqat, he was shot through the back. The bullet passed through, fortuitously, with minimal damage. Still, it was my dad’s dad who had the real military reputation — he led battalions in every military action up through the 1973 Yom Kippur War. When he was growing up, the country that is now Israel was the British Mandate of Palestine, and he became friendly with some British soldiers while working at the RAF Aqir air base. During WWII, according to family legend, he managed to convince a bomber pilot, flying in a fleet of Wellingtons and Lancasters, to take him along on a bombing run of the oil refineries of Nazi-controlled Romania. He was 17 years old. In the Arab world, the War of Independence is known as the Nakba — the catastrophe. Families were forced from their homes, pushed out to the sea, the Gaza Strip, the east, and the West Bank. In the 1967 Six-Day War, Israel took control of the territories. The occupation is approaching 50 years. I came here to write about TV. But all I could do was read the newspaper in horror — the U.N. school bombings in Gaza, scores more children dead; the anti-Israel protests in Europe, always threatening to spill into anti-Semitism — and think about my mother and father and their mothers and fathers. Facts on the ground — a phrase the Israeli-Palestinian conflict truly adores — had gotten in the way. He became the de facto godfather of the movement. But the original goal was modest. Levi knew that creating a “therapy show” — two people in a room — would at the very least be cheap to produce. “I didn’t think anyone would watch it here, let alone other regions,” he said. In the years since, BeTipul has been adapted in 17 countries, from Italy to Argentina to Romania. It is Israel’s most successful format ever. The industry is, or at least was, having a legitimate boom. “We’re on the top of the list,” Tal Shaked, the VP at production house A-Cappella, would explain later. She ticked off the facts: Dutch giant Endemol bought 33 percent of Reshet and 50 percent of Kuperman, local production companies. German media company Red Arrow bought a controlling stake in another local outfit, July August Productions. Keshet has offices in the U.S. and Canada. Meanwhile, reality-TV formats — like Keshet’s Rising Star, which hit ABC this year — are being sold all over the world. “It’s real stuff,” Shaked said. He stepped outside to smoke one of the Marlboro Lights before the conversation turned to the war. “I couldn’t work for the last three weeks,” he said. “I tried. I sit here every day in this café with my computer. And then I go to the news. And what I’m reading very addictively — it’s a kind of obsession — it’s the talkbacks.” It’s the Israeli term for online comments and it’s appropriately dramatic. “It’s like a snuff show,” Levi said. “A hate. This is something that’s happened very strongly in this war. The violence against the leftists.” Etgar Keret, Israel’s most famous pop intellectual, would write about the increasingly bitter division in The New Yorker only days after Levi and I talked. I saw it myself during an antiwar protest in a central Tel Aviv square named for prime minister Yitzhak Rabin, who was assassinated here in 1995 by a Jewish anti-peace extremist after the Oslo Accords. To this day, the Accords are the closest Israel has come to peace. The antiwar protesters set up their rally along the barricades. On the other side of the square, the pro-war faction shouted down their perceived enemies. The police tried to keep the two sides separate, but couldn’t. The rightists spilled over onto the barricades — a small white-haired woman was hoisted atop shoulders to more effectively scream “mavet,” death, to the leftists. Frederick M. Brown/Getty Images Howard Gordon, Gideon Raff, Adam Rayner, Jennifer Finnigan, and Ashraf Barhom of Tyrant in July. At the end of the protest, the rightists trailed the leftists spilling out, targeting and pointing at individual protesters, and eventually shoving and swinging at them. Someone fired from a can of pepper spray. In the confusion, a young man’s forehead was split open. His friends wiped away the blood with a wet towel. When there’s a casualty of war, Levi explained to me, the army sometimes creates a video depicting the circumstances. They show this to grieving parents, who want to understand how their child was taken from them. Years ago, Levi made a short film based on his parents’ experiences in that office, watching the reenactment of the fighting that killed his brother. He called it, with a touch of black humor, Premiere. Levi’s new series, The Affair, starring The Wire’s Dominic West and Ruth Wilson, premieres on Showtime in October. He’s adapting a World War II memoir by a woman named Etty Hillesum, who, like Anne Frank, also kept a diary while hiding from the Nazis and later died in a concentration camp, for a feature film next. He could easily pick up and move elsewhere. At one point in the conversation, we debated the merits of Brooklyn vs. London vs. Mexico City. He could live in those places. He could leave tomorrow. One afternoon in Tel Aviv, I met a reporter named Allison. A friend of a friend, she writes for Mondoweiss, an “anti-Zionist” publication. She’d been visiting Ramallah, in the West Bank, covering the occupation for the past two years. But she’d just returned from Gaza, and was deeply shaken when we met. She’s not a war reporter, she explained. She wasn’t prepared for the sights and smells of Gaza under attack. I told her about my assignment falling apart: how Tyrant left, and there’s no one to talk to at Dig. She had an idea: If I can get her back to Jerusalem — specifically, the infamous Kalandia checkpoint, which regulates movement in and out of Ramallah — she’ll take me around the East Jerusalem Palestinian neighborhood of Silwan. Dig had planned to shoot there, in the City of David park, which created a small kerfuffle that was later swallowed up, as most things were, by the war. There’s a man there named Kalid Zir, Allison told me. He’s living in a cave, in opposition to the City of David, or trying to. I could talk to him. The next day we were in my rental car along with her blue bulletproof PRESS vest and a bag of the clothes she wore in Gaza, sullied by bomb smoke and bundled away like hazardous waste. We parked at the American Colony, a gorgeous old hotel in Jerusalem that acts as the unofficial headquarters for traveling international press covering Israel. Around the corner sits Sultan Suleiman Street, the main commercial drag, which was decorated with strings of colorful light bulbs in celebration of the Eid, the end of Ramadan. The boys were in black T-shirts and jeans, their hair cropped up top and shaved nearly to the scalp on the sides. Some of the girls wore burkas, with heels poking out of the bottom; others wore skintight jeans and unsubtle makeup. From a nearby mosque, we could hear the call of the muezzin. We came to the Old City walls, located across from shops selling striped polo shirts and shawarma, and walked past the imposing stone gate into the Muslim Quarter. 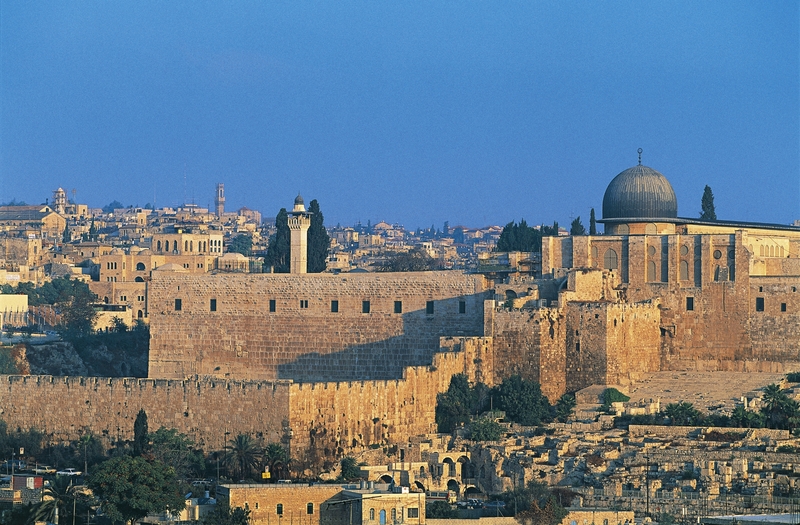 The Old City of Jerusalem is divided into four quarters: Muslim, Jewish, Christian, and Armenian. I’d always walked the Jewish quarter, but it felt familiar nonetheless. Sleek, low stone steps led into the nearly enclosed ancient corridors, the heavy sun sneaking in with narrow shafts of light. We wandered through the streets, past sweets shops, and Allison joked that she might have a second career as a fixer ahead of her. She pointed out a small Jewish housing settlement, tucked underneath an Arab residence. The armed Jewish guards in plainclothes escorted a small group of young girls. Outside the building, Israeli flags competed for space with al-raya, “the banner,” the familiar black flag of Islam. Posted now as a celebration of Ramadan, it has recently lodged itself in the Western mind via nefarious means, from the broadcast images of the rampaging terror group ISIS. We took a left, dodged a security point, and ended up where all the quarters funnel: the Wailing Wall. Crossing the street, we could see Silwan below. Later that night, there would be another bout of violent clashes between the majority Arab population and the Jewish settlers who have burrowed in and Israeli forces patrolling the area. But at this moment, all was calm. Down the hill, we ducked into the City of David, known dismissively by its detractors as a “Bible park.” Five years ago, this was still Silwan residences. Now it’s a hive for Christian tour groups from Japan and packs of Jewish American kids on Birthright, their free heritage trip. The City of David is an ongoing excavation that the Israelis see as a preservation of historically important territory and the Palestinians see as a calculated Jewish encroachment into Arab neighborhoods. The Elad Center, the organizational body in charge, is excavating even further and for a more prolonged period. Which is just the latest development in a long line of contentious or — depending on your point of view — discriminatory housing practices. As Elad itself puts it, the center is hoping for “an irreversible situation in the holy basin around the Old City.” A critical mass of Jews. But people live here, or are trying to. We were far from the bombings and destruction of Gaza, the protests of the West Bank. We were deep in the heart of the practical and mundane. We walked down to the valley, past groups of men in hiking boots and bucket hats — the telltale sign of the settler, Allison pointed out: “The leftists wear them to infiltrate the rightist protests.” Around us were the small settlements where they live. Down in the Al-Bustan valley, past the Kindergarten Azhar Albustan and fig trees, we came across crews of Arab kids running around with plastic guns. But this isn’t America: The toy guns here still look real. Little Uzis. “They’re playing ‘Arab and IDF,’” Allison told me. Their version of cops and robbers. Quickly, I was conscripted into the game: One of the leaders of the tykes, acting up for his pals with a big, confident grin, had me crouch my head down before he put the business end of his gun on the nape of my neck. To their everlasting delight, I was an Arab, temporarily, being marched forward and arrested. Afterward I took out my iPhone, and the kids swarmed together, making perfect “cool guy” poses. When we walked away, I felt a small, sharp sting in the back of my head. When I turned around, I saw the kids firing yellow pellets at us. Caught in the act, they laughed and waved. Finally, we made our way to the cave. I’d expected a remote and desolate space, inhabited by a bearded hermit. But Khalid Zir is a regular guy: mid-forties, muscular, his arms marked by scratches and scars from a lifetime of hard labor. In his sandals, dirt-caked work pants, and tight pink Diesel for Active Wear T-shirt, he gave the distinct vibe of a man who would rather not be living in a cave. DeAgostini/Getty Images The Old City walls and Al-Aqsa Mosque from the village of Silwan. But, he asked, what can he do? His house, which was built on the ledge above the cave, was destroyed a year ago by order of the Israeli government. When he tried to rebuild it, they stopped him. So he thought he’d try the cave. His grandfather had lived in it. He could, too. And for a while his entire family lived there, including five daughters. But they stopped that, too, he said, showing me how far he’d gotten: the bare, mid-construction wall of what might now never be a house. Milling about with us were Zir’s massive, bleating sheep. Out on the street past the cave, Zir had cleaned up a space, built a low guardrail, and added a few couches. He decorated with potted plants and cacti and one painting, of a girl in a hijab with a flower. We sat in this makeshift living room, and one of his daughters fetched us coffee in an ornate silver pot. We drank the stuff, black and thick as tar, out of little plastic cups, as Zir lamented. The Mizrahi music blasted, and nearly every driver passing by stopped to honk his horn or shout hello to the increasingly famous, increasingly resilient Khalid Zir. One offered a friendly “Welcome to Silwan” to Allison and me. Zir shot back weary replies as he focused on his cigarette. With a lull in car traffic came a fellow in a greasy mullet leading a pack of goats down the paved road, their bells clanging nicely. At one point, we went inside to retrieve Zir’s court papers, which are collected together neatly in a plastic bag. Here, read, he said, here, read, handing me the documents. Then he told me to follow him, and so we climbed on top of the hood of a car, then traversed a steep ledge where his house once stood. We could only see the swaying remains of his bathroom. Off in the distance, we could also see the golden dome of the Temple Mount. “Gideon Raff dreams of building ‘Jollywood’ in his homeland,” read an early June headline in the Israeli paper Haaretz. “This is the first time the majority of a [foreign] show is shooting in Israel,” Raff boasted in the corresponding article. “Between ‘Dig’ and ‘Tyrant,’ we are employing hundreds of Israelis, dozens of actors, bringing tens of millions of dollars to Israel.” Within two months of the article’s publication, both shows had to pack up and relocate. FX A scene from an episode of Tyrant. Tyrant wrapped its shooting in Turkey, and ended its first, lukewarmly received season, at the end of August. It was renewed for a second season earlier this month. Dig spent two weeks in Croatia before landing in — of all the possible Old City simulacra in the world — Albuquerque. This summer, Homeland cocreator Alex Gansa explained in an interview, “We spent about two weeks seriously considering the possibility of setting the show in Israel this season, and all I can tell you is that I’m very happy that we didn’t.” Are we still dreaming of Jollywood? Tal Shaked, the reality-TV producer, is sure it will all blow over. Hagai Levi couldn’t care less. I never got to ask Raff: With Dig’s schedule the priority, he was never made available for an interview. Is Raff still optimistic? Could he have said he never saw this coming? “Unless you’re on the ground living in Israel,” he told Haaretz in June, “you don’t really understand the situation and the complexity.” It’s something of a local mantra. With tragedy happening on a daily basis, dashed business opportunities feel meaningless. But the deferred dreams of filmmakers, writers, and, yes, even reality-TV producers point to the same place as the broken peace treaties and the incomprehensible violence — the impossibilities created by conflict. Back in Silwan, I raised the subject of Dig with Khalid. “Did you know about this show?” I asked him, pointing back up at the City of David. He shrugged. Maybe he’d heard of it, but he wasn’t particularly stirred. There were more stubborn issues at hand. This article originally misstated the year of Yitzhak Rabin’s assassination as 1994.